An education technology company has released results from its latest teacher survey. Among the findings: funding for ed tech is the biggest issue for most schools; augmented and virtual realities are hot really only with pundits, not classrooms; and Google is a top choice. According to the 2018 Kahoot edTrends Report, which surveyed 1,516 people, lack of funding topped the list of main challenges faced by teachers in implementing ed tech successfully, referenced by 51 percent of respondents. Lack of training came in second, mentioned by 45 percent of teachers. 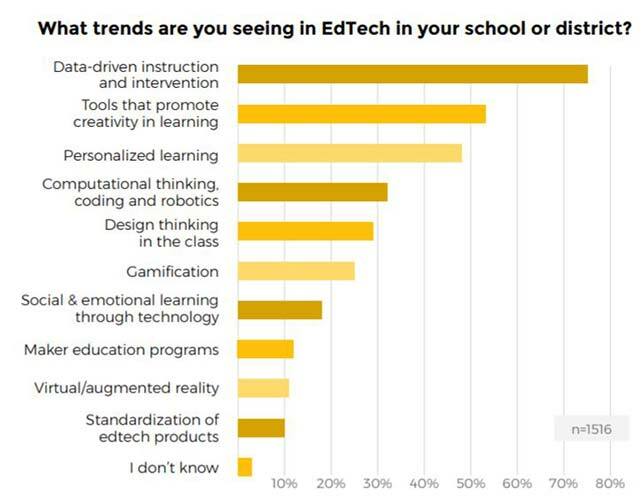 Respondents reported that the major ed tech trends they're seeing in their districts were data-driven instruction and intervention, designated by three-quarters of teachers, followed by "tools that promote creativity in learning," listed by slightly more than half of survey participants. VR and AR, however, appeared way down the list with just over 10 percent of teachers reporting that it's showing up in their schools, beat out by personalized learning, computational thinking, design thinking, gamification, social-emotional learning and maker education. Trends for ed tech. Source: the 2018 Kahoot edTrends Report from Kahoot. Google is becoming a favorite with teachers and students in U.S. K-12 classrooms for both hardware (Chromebooks) and software (Google Classroom, used for instruction by 53 percent of respondents). However, when measured by Kahoot student usage, iOS still beat out Chrome OS (39 percent vs. 33 percent), although Apple's usage is shrinking, while Google's is growing. Among teachers, Windows still dominates for Kahoot usage, referenced by 56 percent of educators, compared to 17 percent who listed Chrome OS and 9 percent who mentioned iOS. The results are openly available on the Kahoot website. The Kahoot platform, which the company claimed has 70 million active users each month, is a game-based classroom response system that uses quizzes, discussions and surveys to inspire learning.